2. Search for the Member using the search box, click on the member and the Subscriptions button. This needs to be done at the Lowest Tier the Member sits in (eg. their Club's console). 3. 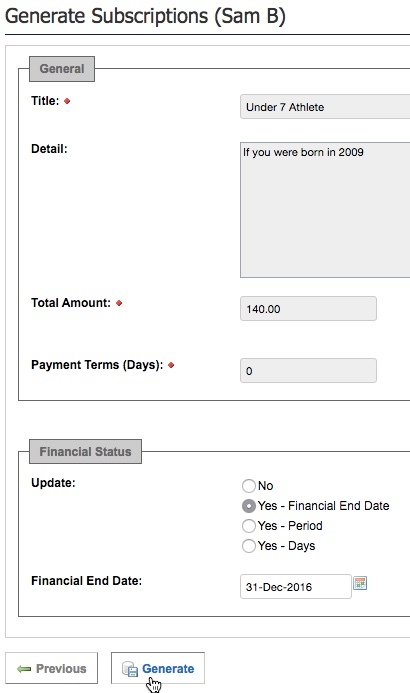 Select the Subscription Type you wish to generate an Unpaid Transaction for, then click Next. Additional Information: You can also generate a subscription through Subscriptions, Single member. To do this go to Subscriptions, Generate Supcription, Single Member, select the member and click on the Subscription Type, and click Next. 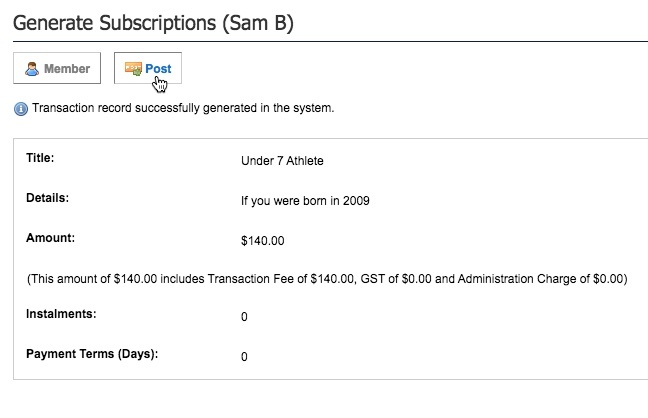 Amend any detail of the subscription as required and click on the Generate button. You can now review the subscription, once4 happy you can click Post to post this subscription to the members record. You can then pay this subscription by clicking on the Payment button or the member can log in to their profile and pay off this subscription.